OutYouth, an Austin nonprofit, offers counseling and services for LGBTQ youth and their families. Since 2007, Houston Democratic state Rep. Garnet Coleman – and others – have tried in vain to get just five words into Texas' hate crimes law: "or gender identity or expression." Victims of crime motivated by race, gender, sexual orientation and religion have been protected by the state's law, which was spurred by the 1998 murder of James Byrd Jr. in Jasper. State lawmakers passed a bill in 2001, but protection based on gender identity has been absent in the law's nearly 20-year lifespan. That's not for lack of trying on Coleman's part. He's been trying to pass a bill to include protections for transgender Texans in the hate crimes law for the last six legislative sessions. When he first filed a bill to increase penalties for those accused of targeting transgender and gender nonbinary people, he didn't expect much – and he didn't get much. It failed to get a committee hearing. The next session, he filed it again, and it went to committee, but that's as far as it got. A pattern began to emerge. The bill stalled out after a public hearing in the 2011, 2013 and 2015 legislative sessions. He filed it again last session. Nothing. It didn't even get a hearing. "At the end of the day, it is very disappointing that this is an issue that the Legislature seems to want to avoid." Coleman says that's emblematic of a larger problem at the Texas Capitol. "I think there's still a bias against people who are transgender. There's still a bias against people who are gay and lesbian," he told KUT. "There's a bias." Chuck Smith, who recently stepped down as head of the LGBTQ advocacy group Equality Texas, says that while that legislative inactivity persists, transgender Texans face an outsized risk of violence. "Texas, sadly, leads the country in the number of transgender people who have been murdered," Smith said. "The majority of those people have been transgender women of color. And it is an epidemic that does not seem to be abating." According to the National Coalition of Anti-Violence Programs, seven murders in Texas in 2017 were motivated by bias against LGBTQ people. Four of the victims identified as trans. Nationally, the number of LGBTQ people killed that year was 52, up from 28 in 2016. For advocates like Smith, the lack of action on the part of Texas lawmakers is disheartening. "At the end of the day, it is very disappointing that this is an issue that the Legislature seems to want to avoid," he said. For Anemone Schlotterbeck, a clinical social worker at the Austin nonprofit OutYouth, that risk of violence – especially sexual violence – is real for clients she counsels, many of whom are trans. But, she says, instances of hate crimes are, in her experience, outliers. Trans people typically face more subtle, less violent, mistreatment every day. Anemone Schlotterbeck is a social worker at OutYouth. She says hate crime protections wouldn't necessarily ameliorate problems of discrimination and harassment faced by transgender Texans, but it may encourage more people to file police reports. She says it's a daily "drip drip" of discrimination and points to last session's so-called bathroom bill, which would have restricted transgender bathroom use. That sort of legislative push sends a bad message to trans youth, she says, who often feel targeted from an early age, when they're still forming their identities. "People are like, 'Oh! Trans people, so scary!' If you met our kids, they're just wonderful, weird teenagers," she said. "I love them and they're brilliant – and also not that different than any other teenagers." More often than not, Schlotterbeck says, her clients face housing and employment discrimination, harassment or even seemingly little things, like being mis-gendered. But in those drastic instances, when trans people do report being victimized because of their identity, she says, not much comes of it. "Most clients I've talked to who've reported things to police haven't had their reports taken seriously," she said. That, she says, has discouraged some of her clients from reporting to police at all. "I'm not sure locking more people up would actually make trans people safer." Texas has been recording whether victims were targeted on the basis of gender identity since 2014. From 2014 to 2017, an average of 2 percent of hate crimes in Texas were motivated by gender identity, according to the Texas Department of Public Safety's Universal Crime Reporting data. While the U.S. Census Bureau doesn't officially measure population on the basis of sexual orientation or gender identity, an estimate from the Williams Institute at UCLA suggests people who identify as transgender make up less than 1 percent of Texas' population. 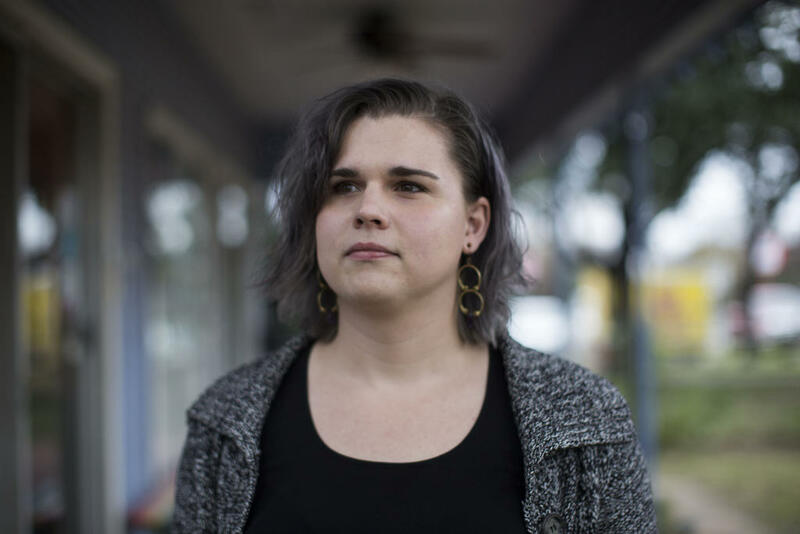 Austin led the state in hate crimes, according to the latest data from the FBI, but only one case targeted someone on the basis of gender identity. Darla Gay with the Travis County District Attorney's Office says a new state law wouldn't necessarily force police to take those reports more seriously. While it would give prosecutors more options to charge possible hate crimes, the problem, she says, is that intent is often hard to prove in court and prosecutors already have a lot of leeway in increasing punishment for those who appear to have committed a hate crime. But Gay says changes in state law could encourage more trans people to come forward, if they believe they're the targets of a hate crime. "So, it's the reporting aspect that could be improved," she said. "Because they feel like they're being respected enough and heard enough to pass a law to add them to the protected classes." Coleman says he plans to file a bill again this session. "From the perspective of change, change takes time," he said. "But sometimes stars align and things happen." Even if a bill does ultimately get to Gov. Greg Abbott's desk, Schlotterbeck says she'd rather see the state adopt a more inclusive attitude toward trans people. The UT Austin program aimed at expanding masculinity is back from a five-month hiatus after conservative media outlets accused it of treating masculinity as a mental health issue. In 2015, the MasculinUT program was created within UT’s Counseling and Mental Health Center. Its goal was to engage the community in challenging stereotypes surrounding masculinity, with a goal of reducing interpersonal violence and sexual assault. Austin led Texas in the number of hate crimes reported last year, according to FBI data. The FBI’s 2017 hate crime statistics data show the state capital had 18 total incidents, marking the third year in a row the city saw hate crimes in the double digits. In the weeks after a series of vandalisms at the North Austin Muslim Community Center, Imam Islam Mossaad says prayer services have continued as usual, but the mosque has stepped up security. Cecilia Melchor had a friend visiting from out of town last Wednesday. The 22-year-old UT-Austin student didn’t necessarily want to go out, but her friend insisted. They grabbed some dinner before heading to the Chuggin’ Monkey on East Sixth Street. Melchor had to use the restroom. When she was finished, the bouncer approached her.